As the latest criticisms of the recently announced Academy Award Nominations continue to stew, I so continue my quest to see all the Best Picture nominees. In the midst of all the negative press on the lack of diversity in the Nominations, I saw director Ava DuVernay's powerful new film Selma. It's a worthy Best Picture nominee, not only in its power but in its craft. It's a well-made film about a time of great upheaval and change. I want to go on record and say that "NO. I don't think the Academy voters are being racist, but I do think they've missed by not nominating this film's director." She is a force to be reckoned with and found a lead actor in David Oyelowo who matches her will. Selma recounts the days surrounding the emergence of Dr. Martin Luther King and his Southern Christian Leadership Conference (SCLC) in a small, rural town of Selma, Alabama. The fight at this point in the Civil Rights Movement is for voting rights. As the film opens, we are greeted with Dr. King (Oyelowo) and his wife, Coretta (Carmen Ejogo), in Norway, where King is to accept the Nobel Peace Prize. Meanwhile, in Alabama, a middle-aged woman, Annie Lee Cooper (Oprah Winfrey), is angrily denied the right to register to vote. This is in addition to the regular murders and beatings of African-Americans happening throughout Alabama and the rest of the South. 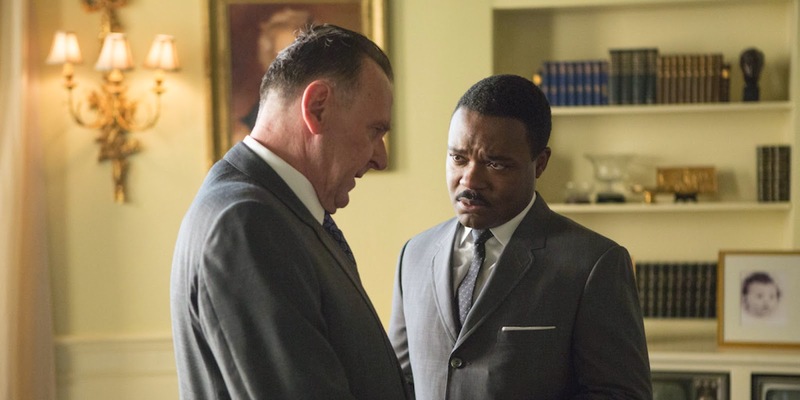 The plan is to gather in Selma and march to Montgomery, bringing the non-violent protest to the front-door of Alabama Governor George Wallace (Tim Roth). With Selma, director DuVernay has achieved a balancing act of sorts. She is charged with painting a picture of a man, a very real man, during one important battle in the decades long war for equality. She does this with the dynamic of King and his wife, struggling in making marriage and family work in the shadow of death threats and smear campaigns. On the other side, there is King as the leader of a Movement. During several meetings with President Lyndon Johnson (Tom Wilkinson) and with King and his close circle of friends and colleagues, we see just how complex these issues were. It's not only voting rights at stake. Much has been said of this movie painting President Johnson in a negative light. I can't totally agree with that. We can't possibly fathom what governing our country at this time must have been like. And, in a late scene, between Johnson and Governor Wallace, we see the President we've come to know in LBJ. A man willing to stand up for what is right, despite an immense amount of internal struggle. Wilkinson's portrayal of Johnson is one of the highlights for me, as is Roth's portrayal of Wallace, a man willing to turn a blind eye to the atrocities happening in his home state when he well-knows he alone can change things. 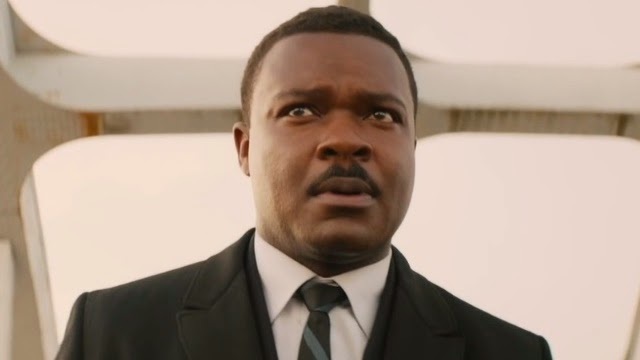 David Oyelowo was robbed of an Oscar nomination here, though, in a year of miraculous leading male performances, I can't say who he should replace on the ballot. This is a performance of an incredible magnitude. He plays King not as an impression or impersonation but as a real, breathing human being. He embodies the man. The weight of the Movement and of the fight and of his faith and of his marriage, for once, becoming something palpable. That he is British and can look and sound so much like a man from Georgia, USA, is astounding. 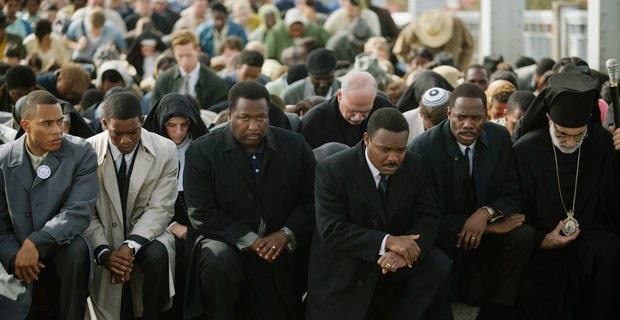 Selma is a movie pulsating with emotion. Sometimes, it's hard to watch. The scene of the first march attempt and the nationally-televised beatings on the bridge out of Selma is a piece of incredible filmmaking. It is, at once, a well-crafted action sequence and an up-close confrontation with an unimaginable hatred and violence. The cinematography by Bradford Young is shadowy and dark and beautiful. Some of the best of the year. Yet another miss by the Academy. The interiors, including scenes in King's Atlanta home and in a Selma jailhouse after an arrest, are beautifully shot and match the emotional states of the characters. However, at times, Selma slows almost to halts, which is my one and only criticism. I got bored, even lost in my own thoughts occasionally, and wished for the story to move forward more quickly. It strikes hard and quickly, then backs off. Then strikes hard again and backs off. Yet, in the end, the powerful message brought forth in the final scenes hits hardest of all and you're left with feelings of sadness, inspiration, and pride. A hero is defined as a PERSON admired or idealized for courage, outstanding achievements, or noble qualities. 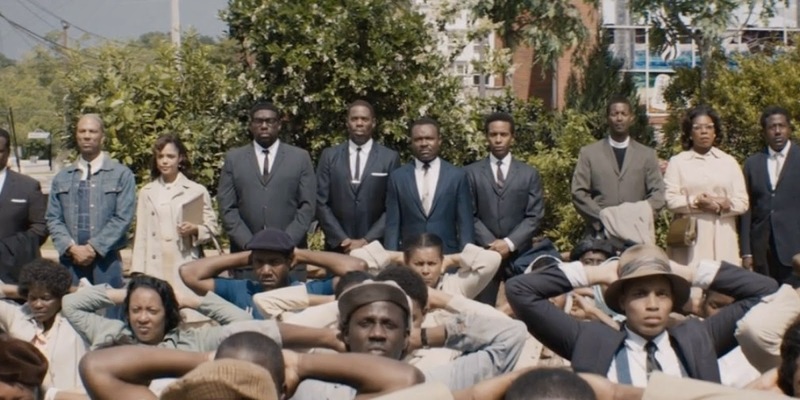 Ava DuVernay' Selma, driven by a powerful performance from David Oyelowo, reminds us of this. We have heroes in this country. Few more truly so than Dr. Martin Luther King, Jr.